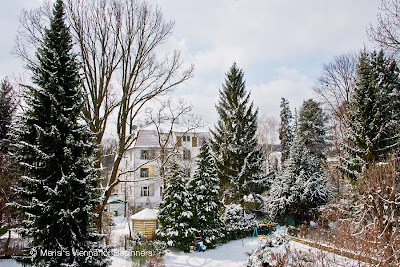 Merisi's Vienna for Beginners: 55th of February, 2013Welcome to Vienna in Winter! Welcome to Vienna in Winter! into summer, if must be! It will, of course....it just doesn't feel like it. So, it is not just the UK that is shivering? Let's hope this weather front moves soon! Oh no! And it was looking so lovely and spring-like!! We are slow to see our spring this year as well, but I remain hopeful! Thank you so much for your lovely comments! I am always so happy to see that you have paid a visit! Wishing you and your loved ones a beautiful Easter, Dear Merisi! Wow Merisi, over here in New York we are feeling glimmers of warmth and seeing blue sky with puffy clouds moving around. Let's hope that you'll soon be getting some of this trend. Meanwhile, when I saw your snow accented fir trees, I was immediately reminded of some Christmas decorations we had at my childhood home. The little trees were sort of bristle-y, with some sort of probably glue-based snow on the tips of their "branches." Now the inspiration appears via your photography...just as we should be seeing Easter flowers and eggs and bunnies. Global climate change seems to have a certain sense of humor. Wow! I love it! It's a very good postcard for next Xmas time. Yikes. Whereas this kind of weather is still considered "normal" at this time of year here in eastern Canada (even though we're all grumbling about it) you in Vienna must be in shock! At least it makes for scenic "winter" pictures. Hopefully, you'll be able to look back on this as "that was the winter that was" rather than it becoming the new norm. Courage, ma chère! The fresh snow of winter scenes are always so attractive yet the reality is often quite different. Lovely photo, but snow...please go away!